The UK office market continues to show promising signs of recovery. Office deals in London could exceed 13m sq ft by the end of this year and Metropolis H1 2014 research has identified over 300 companies actively searching for central London office space. Over half of the 10m sq ft required in central London is fueled by the City, where 169 companies search for a total of 5.7m sq ft. Notable City of London requirements include a 300,000 sq ft search by a UK investment and asset management firm and a 250,000 sq ft law firm search prompted by consolidation of two offices. 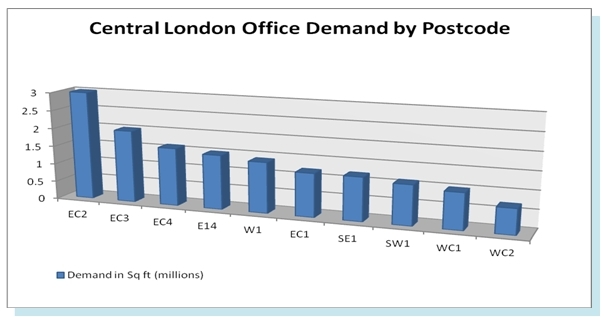 Demand for space in the West End, once again the most expensive office location in the world (CBRE Global Research), was 1.3m sq ft in the first six months of 2014, with 1.2m sq ft required in Mid Town. 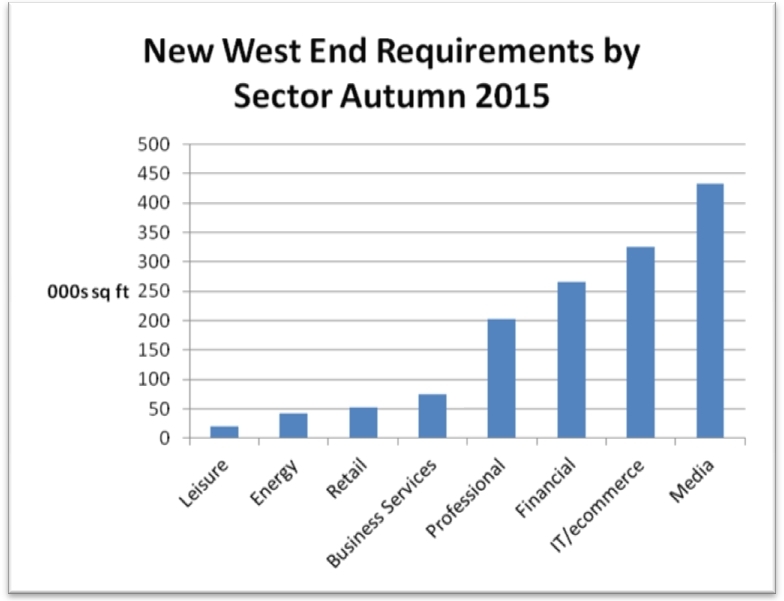 Two of the top three West End requirements by size originate from major advertising companies. 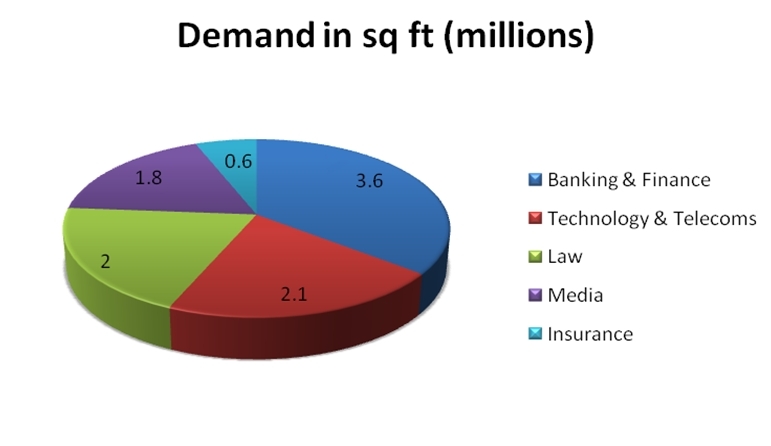 Law and media sector requirements dominate Mid Town demand, with over 200,000 sq ft required by law firms and 250,000 sq ft required by media agencies. 1.4m sq ft of demand was researched in Docklands and 0.4m sq ft of demand was researched in South Bank, where rents on new schemes have recently reached £50 psf. Our UK research as a whole identified over 700 companies searching for a total of 20m sq ft, 16m sq ft in the South of the UK and 4m sq ft in Wales, Midlands, North and Scotland. The Banking & Finance sector is leading the demand for new UK offices, with just over 3.6m sq ft of requirements in the UK, 2.6m sq ft of which is sought in the City of London. The Technology and Telecoms sector accounts for 2.1m sq ft of UK demand, Law 2m sq ft and Media 1.8m sq ft.
1m sq ft of office demand was identified in the North West, 0.6m sq ft of which was attributed to Manchester. The Manchester office market is looking lively, with take-up reaching 800,000 sq ft in H1, making it the strongest regional performer. Just under 1m sq ft of demand was identified in the Yorkshire and Humberside region, with 70% of searches focused on Leeds. Notable requirements in Leeds include a 70,000 sq ft law firm search and a 60,000 sq ft search by a major accountancy firm. 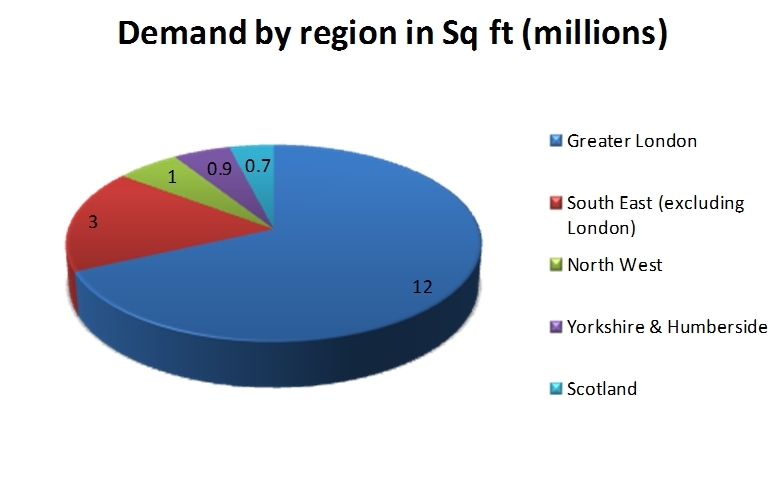 Just under 500,000 sq ft of demand was identified in both Birmingham and Edinburgh. Two of the largest requirements in Birmingham were law firm searches for about 30,000 sq ft and a major accountancy firm was also linked with a requirement for 50,000 sq ft. In Edinburgh, the majority of office requirements were for less than 10,000 sq ft, although a 75,000 sq ft requirement from a computer games studio and a 40,000 sq ft law firm search were notable exceptions. 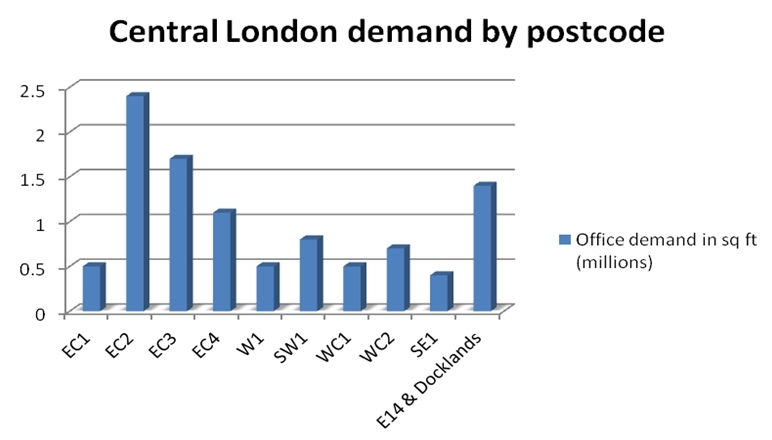 After an encouraging start to 2014 UK office demand looks set to comfortably outstrip its 2013 levels. 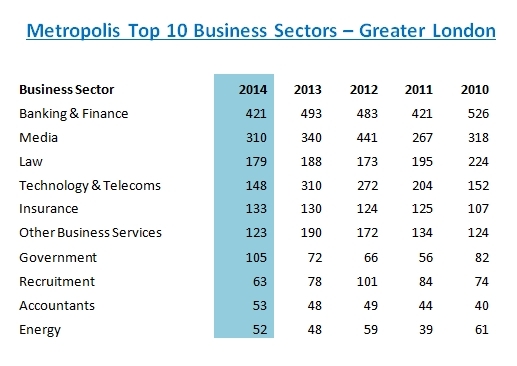 In central London, notable office searches include requirements from Societe Generale, Wells Fargo and National Grid. In Manchester, H1 office deals include lettings to Slater Gordon, Trader Media and Barclays Bank. Bristol and Edinburgh also saw a better than average six months, with a number of requirements, including Ovo Energy in Bristol due to come to fruition in the second half of 2014. Birmingham also has a number of requirements from law firms and accountants including BDO. In Glasgow, searches by Cigna and National Rail are expected to complete soon. Cardiff has seen some activity at its new schemes, while Liverpool has seen a number of midsize deals.